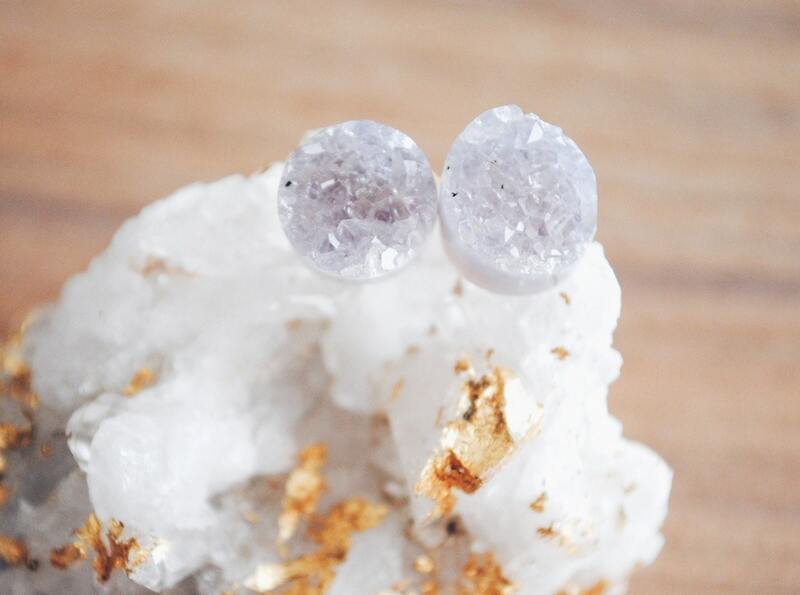 ⊿⊿ These earrings feature gorgeous natural druzy studs that have a polished edge on gold tone nickel and lead free brass posts. The backs are a bullet clutch earring back style with attached pad. ⊿⊿ I have several of these available. Refer to the last image and make your selection at check out. The studs are about 9mm in diameter (about 3/8") and each pair has been matched for best color and size compatibility (although each individual earring is completely one of a kind and unique). The colors are mostly in the tones of light gray and light, light lavender with flecks and inclusions and visible striations on the polished edge (actual color will vary from the colors on your screen). ⊿⊿ Druzy is a layer of crystal formations that develop on the surface of or inside a geode. This color druzy is all natural and these stones are not resin, they are genuine druzy stones.